When size matters, look to the IWG-M1 for the smallest and lightest water module in the business aviation market. Currently International Water-Guard’s first compact water module, the IWG-M1 incorporates a high level of innovation. This sophisticated new product delivers pressurized hot and cold water to an aircraft’s lavatory vanity or galley faucets. It is made up of a pressurized pump, water heater, motorized /manual drain valve and a system controller. Compact – our compact water module fits in tight spaces like galley cabinets, in bulkheads, and lavatory sink cabinets. Lightweight – we guarantee that the module is the lightest and smallest on the market, weighing only 9.8 lbs. Innovative – the module includes remote monitoring, control capability and active freeze protection. 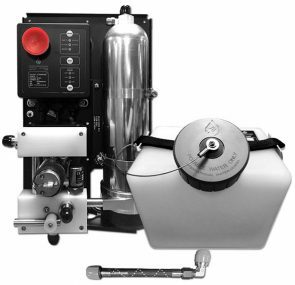 Easy to Maintain – The IWG-M1 requires minimal maintenance and is easy to operate electric or manual drain. The IWG-M1 has been selected for standard installations on Bombardier’s Challenger 350 through FACC and is suitable for other business jet and airliner type aircraft. View the IWG-M1 Unit. Contact us directly to learn more.